How does Naviance Student support student success? Naviance Student makes it easier and more engaging than ever for students to answer the four most important questions that shape their future: Who am I? What do I want to be? How will I get there? and How will I succeed? 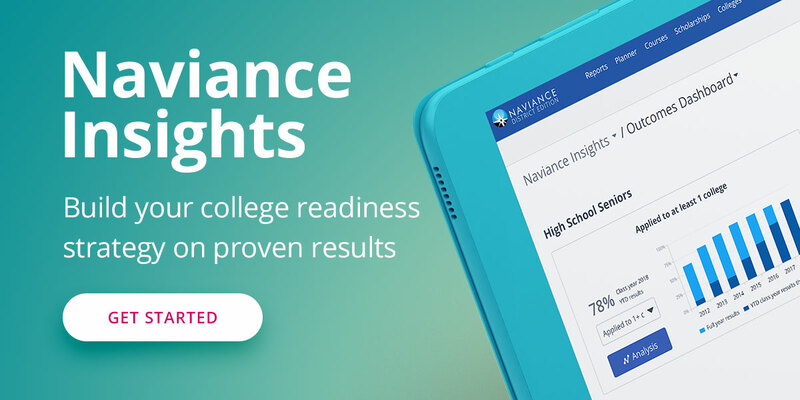 The new mobile-friendly design delivers the power of Naviance to students’ fingertips with familiar and intuitive tools that personalize and simplify the college and career planning process. Has Naviance Student replaced Family Connection? Yes, Naviance Student has replaced Family Connection in the 2018-19 school year. What are some of the main differences between Family Connection and the new student experience? Accessible Anywhere: As a tablet and smartphone-ready experience, Naviance Student is available where students are - on their devices. More Engaging: The modern, student-centric design brings college and career exploration and planning to life. Easy to Use: With a familiar layout and workflow, educators and students will find Naviance Student easy to use. Can my students use Family Connection during the 2018-19 school year? No, Family Connection is no longer available, but Family Connection features are available in Naviance Student. Will my students and I need to learn an entirely new student experience? The layout of Naviance Student is consistent with Family Connection today, making the transition easier for students and staff. Is there an additional cost for the new student experience? Naviance Student is included in every Naviance subscription. There is no separate charge. How do students login to the new experience? Students will login with their same usernames and passwords that they used with Family Connection. For Naviance District Edition clients with the Clever integration, students will continue to access Naviance from the Clever dashboard. No further action is required. Students can login to Naviance Student here. Can parents access Naviance Student? Yes, parents have access to Naviance Student. Like Family Connection, parents have view-only access to students' plans. Parents can login to Naviance Student here. Do I need to update the Naviance URL on my school or district's website? While students are re-directed to sign into the new experience from your current login page, we recommend updating the URL to student.naviance.com/[your school's account name] going forward. Will the student experience of Naviance Test Prep and Naviance College & Career Readiness Curriculum change when Naviance Student is introduced? No, the launch of Naviance Student does not affect the student experience of Naviance Test Prep and Naviance College & Career Readiness Curriculum. Students will continue to access Naviance Test Prep and Naviance Curriculum from the home page of the new student experience. What support is available for upgrading to the new experience? Video tutorials as well as parent and student facing materials are available to ensure a successful transition to Naviance Student. Naviance Professional Services is available to assist in supporting your transition to Naviance Student. Please contact your Account Manager or call 1-866-337-0080 for more information. Why did you change the name from Family Connection to Naviance Student? Students are at the center of your work and our work. The name 'Naviance Student' emphasizes that we are all committed to student success. Counselors, teachers, parents, and administrators are critical supports to helping students reach their college and career readiness goals. Feel free to reach Naviance Support Services by calling 1-866-337-0080.